When preschool students see the lion on the flashcard for the letter "L" come alive and roar, they typically jump back and squeal with delight. Their reaction isn't far removed from how educators respond the first time they see this phenomenon, as well. "We were blown away by the technology," said James Cupit, an early childhood administrator for the School District of Philadelphia. "We had never seen anything like it." The city's public school system bought a supplemental augmented reality curriculum for teaching early literacy skills from Alive Studios for 37 of its preschool classrooms. The kit comes with flashcards for each letter of the alphabet, and each letter has a 3D animation associated with it. When teachers hold the cards under a document camera and move them around, the animations come to life on a computer screen, bringing 3D learning to students without the need for special glasses. Students hear the letter sounds as they watch the animation, which taps into different learning modalities and helps the information stick. Alive Studios points to independent research suggesting 48 percent gains in letter naming fluency and 112 percent gains in letter sound fluency from using the curriculum. "I can be skeptical when it comes to using technology in the classroom. I think young children have too much screen time as it is," Cupit said. "But with this technology, the students are really learning from it. And it's engaging. Kids are excited about it." Augmented and virtual reality have been touted as emerging learning tools for years. Now, their promise is finally being realized in thousands of classrooms worldwide. 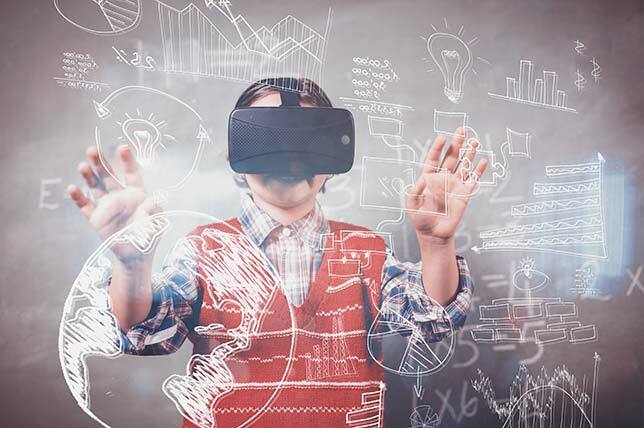 "Augmented and virtual reality are transformational technologies that can change existing pedagogies for the better," said Ben Fineman, program manager for cloud collaborative services at Internet2, an advanced technology consortium of universities and research organizations. Augmented reality (AR) is a technology that layers computer-generated enhancements on top of existing reality. Virtual reality (VR) is a fully immersive experience in a computer-generated environment. For a long time, the hype surrounding these technologies outpaced their usefulness in the classroom. 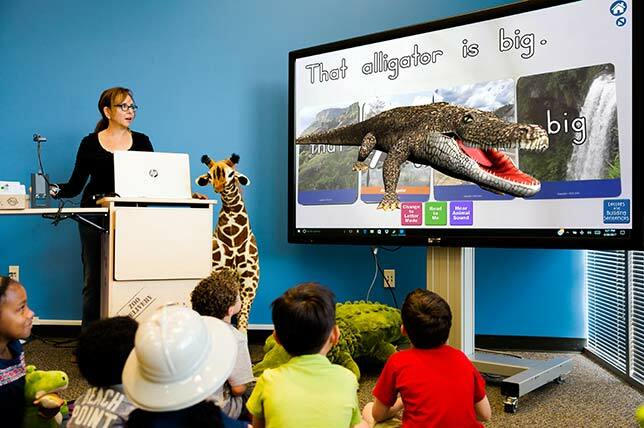 But now they are poised to make a real impact on teaching and learning, Fineman said, as hardware costs have come down and new applications have emerged that put AR and VR within reach of most schools. VR headsets range from about $400 for the Oculus Rift to just $10 for Google Cardboard, though schools will need smartphones to use with the Google Cardboard viewers. Virtual field trips are among the most promising applications of the technology, Fineman said, allowing students to experience places that would be impractical, unsafe or impossible to visit in the real world. For instance, students can visit a wide range of physical locations around the world using Google Expeditions. They can take a tour of the solar system with apps such as Titans of Space. And students in construction trade programs can virtually tour a construction site to learn about safety violations without being exposed to danger. Interest in AR and VR among educators is growing. At the Texas Computer Education Association annual conference in February, more than a dozen sessions focused on practical applications of the technology for learning. April Britton, an art and enrichment teacher at Atlanta Elementary School in Texas, was among the scheduled presenters. Britton's students all have iPad Minis, and she uses AR to enhance her students' understanding of topics — while also capturing their attention. "I feel like it's a way to get them engaged and motivated to learn," she said. But it's not all about sizzle. AR also helps her students visualize key concepts. For instance, she uses an app called Elements 4D to help bring chemical elements to life for her students. Teachers can print out paper cubes representing various elements, and when students hold these cubes in front of their iPad's camera, they can see the element in its natural form on the iPad screen. What's more, when students push the blocks together, they can see those elements combine to make a new substance. If students touch hydrogen blocks to an oxygen block, they will see water virtually form within the cubes. Britton also uses a series of augmented reality books from the U.K. publisher Carlton Books, with titles such as iScience, iSolar System, iStorm and iDinosaur. When certain pages are viewed with the Digital Magic app, the books come to life — allowing students not just to read them but to actually experience them through hands-on activities. As students are learning about the concept of force, for instance, they can see for themselves how much force is needed to push something over by pressing on the screen. The interactive nature of the content "usually spurs a desire for further exploration," Britton said. She added: "It's no secret that it's a constant struggle for teachers to connect reality with the digital world. Augmented reality does that very well." Students aren't just consuming AR and VR content. They're also creating it — while learning valuable technology skills in the process. Britton has her students use Aurasma (now called HP Reveal), a platform for creating AR experiences, to enhance their presentations. In one project, students researched different types of homes from around the world, like a yurt, teepee or castle. They designed a house in the style of their choosing, then created it using a 3D printer. "For the culmination of the project, students recorded themselves talking about their home and its culture, and they used Aurasma to connect the video to their dwelling instead of creating an old-school trifold board," she said. When someone scanned a student's home within the app, the student's video popped up and delivered information about the structure. Google Expeditions has launched a program that allows students and teachers to create their own AR experiences. With Expeditions AR, students and teachers can use Google's AR technology to map the physical classroom and place 3D objects within it. In Arkansas, students in the state's Environmental and Spatial Technology (EAST) Initiative classrooms are using VR technology to solve real-world problems of their choosing, thanks in part to a donation of Oculus Rift VR systems from Facebook. In EAST facilitator Shelly Jones's classroom at North Little Rock Middle School, students have used a Ricoh Theta 360-degree camera to capture images of their community and game development platforms such as Unreal Engine and Unity to create VR environments from these images. One group of students created a virtual map of their entire school building that police and fire personnel could use in trainings and simulations, or when responding to an emergency. Another created a VR environment for special-needs students to practice how they would respond to a fire alarm or other emergency in their classroom. A third group built a VR game to teach people about hunting safety. Learning how to build virtual 3D environments "gives kids an advantage" if they want to pursue a career in science or technology, Jones said. And while she doesn't use AR or VR technology in her teaching of content, many of her students have explored virtual environments for themselves by using Google Expeditions in their social studies classes. "When they see an image come to life, it stays in their mind for much longer than if they just read about it in a book," Jones said. "When you see something like that, it never really goes away."